Lateral window sinus graft. When and how? 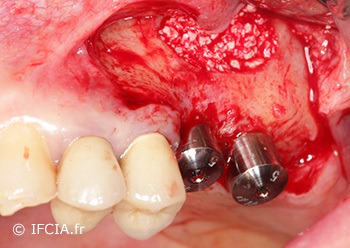 A 64 year-old woman referred by her attending practitioner to replace the missing 26 and 27 in order to restore masticatory function with an implant-borne prosthesis. The preferred therapeutic solution is to restore a unilateral partial free-end edentulism. The medical interview does not highlight any general pathologies, nor any contraindications to oral surgery under local anaesthesia. An occasional smoker, she has no allergies and does not take any medication. The facial and profile examination shows harmonious thirds of the face. 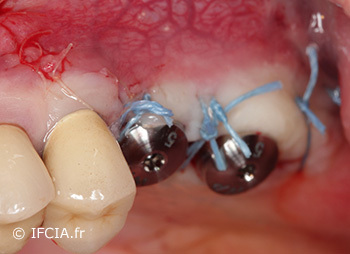 The intra-oral examination reveals a number of restorations on natural teeth and implants. 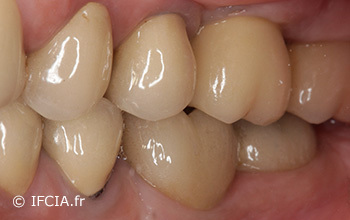 On the periodontal level, the patient shows a generalised chronic periodontitis with a bone level at the cervical third, a type II periodontium according to Maynard and Wilson. Plaque control is average with the presence of tartar, so a thorough scaling will be carried out prior to the operation (Fig. 1). Fig.1: Left clinical view, note a slight gingival inflammation associated with the tartar and a left posterior maxilla edentulism. The patient's occlusion does not present any particular abnormality. The prosthetic space is adequate with a relatively low height at 27. The patient's mouth opening is reasonable. On the panoramic X-ray, the residual osseous volume appears to be insufficient in the left maxillary. Placing implants in sector 2 is impossible without a bone augmentation (Fig. 2). A sinus graft was performed on the right side in February 2012 with a simultaneous implant placement of 14, 15 and 17. All the implants are well integrated with an adequate osseous level except for 46 and 47, which present a more pronounced bone remodelling without any signs of inflammation or infection (implants placed in September 2005). Fig.2: Initial dental panoramic X-ray showing the absence of periodontal pathologies, except for the presence of a number of restorations on natural teeth and on implants. The 3D examination confirms the diagnostic; a graft will be performed on the day of implant placement, if all conditions are met (Fig. 3 and Fig. 4). Fig. 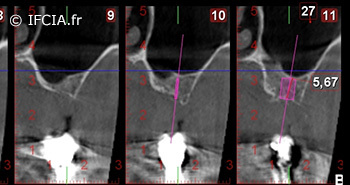 3: 3D sections showing a healthy sinus with significant pneumatization of the maxillary sinus and a residual height of 3.85mm. Fig. 4: Site of tooth 27, the residual bone height (5.67mm) enables a simultaneous placement from the implant to the sinus graft. A lateral approach of the left sinus is performed with the simultaneous implant placement. A full-thickness flap is reflected. The opening of the window is initiated with a round bur carbide and completed with a round diamond bur. After separation of the sinus membrane, a graft material composed of 2.25g small granules of Bio-Oss® (Geistlich) is tightly packed into the sinus cavities. During this session, two Nobel Speedy WP de 5 x 13 mm (Nobel Biocare) implants were placed at the 26 and 27 with final insertion torques at 35 Ncm for 26 and 20 Ncm for 27. The vestibular window has been filled with a Bio-Gide (Geistlich) membrane. The primary stability of the implant has allowed them not to be buried, avoiding a second operation for the patient and saving time on the healing of the mucosa. 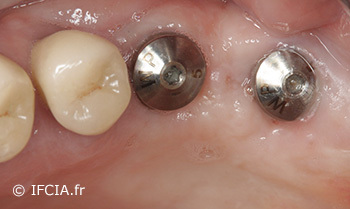 WP 6x5mm healing abutments are connected and tightened to 20Ncm. Hermetic sutures are performed after a soft tissue management in order to cover the interproximal papilla next to the implants. An 8-month healing period is observed following which a green light will be given to initiate the final prosthesis on the implants. Fig.5: The window obtained by milling and piezosurgery, the separation of the sinus membrane is followed by a filling with Bio-Oss® (Geistlich). The drilling of implant sites was performed after the sinus lift but before the filling. Fig.6. Hermetic sutures are performed with polyester 3/0 (Ticron, IPP Pharma) discontinued sutures on the ridges and is completed with a resorbable 6/0 (Polysorb, IPP Pharma) thread at the releasing incision. The clinical examination (Fig. 7 and 8) before the start of the immediate prosthetic phase revealed immobile implants and a healthy peri-implant mucosa with an adequate amount of keratinized gingiva. Fig. 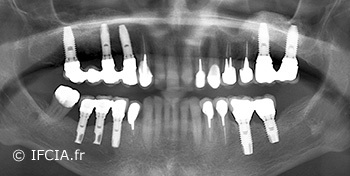 7 : Panoramic control at 8 months showing bone stability around the implants as well as an intra-sinus augmentation. Fig. 8: Control of healing at 8 months post surgery showing a healthy peri-implant mucosa. A traditional pickup impression is performed and, then, a final metal-ceramic bridge is cemented with a glass ionometer on abutments (Esthetic Abutment, Nobel Biocare). Fig. 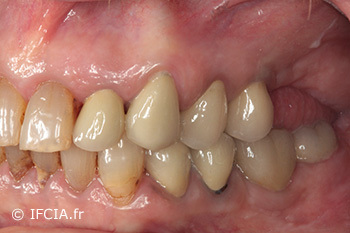 9: A cement-retained metal-ceramic bridge, control at 1 year showing the stability of the aesthetic result (Prosthesis Dr Laurence Gabison). Yearly supportive implant therapy is put into place with a clinical and radiographic examination. It tracks the integration of the prosthetic restoration, and the status of the mucosa and of the peri-implant bone level. Fig. 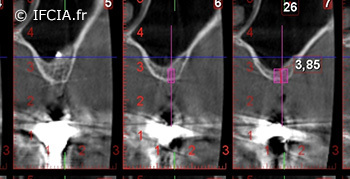 10: Panoramic control showing the stable peri-implant bone level and the sinus graft. The lateral window sinus graft is similar to the GBR within a cavity. Therefore, the bony window should be as small as possible to promote bone healing by improving the vascularisation and the supply of osteoprogenitor cells and, then, by ensuring the stability of the bone graft. However, it must give access to the sinus, allow the separation of the Schneiderian membrane without a tear, and place and pack the graft material. The position of the osteotomy will depend on the maxillary sinus. Its anterior and inferior limits are recessed around 2 mm from the antero-inferior wall and from the inferior part of the sinus; the size of the bony window is usually 10 mm long and 8 mm in height. Its shape is rather pyramidal with an apex base and rounded angles. Minimal residual height is required under the inferior part of the sinus in order to place implants at the same time as the sinus lift, thus avoiding an additional procedure to the patient. This approach, which has become a standard procedure in implantology, allows for reproducible results almost equivalent to those obtained in the original bone. The rate of osseointegration of implants in grafted sinus seems sufficient to ensure a high survival rate. However, the invasive aspect of this type of operation and the potential risks of infection require adequate training for the surgeon. Moreover, patient selection and the environment in which this procedure is performed are essential for its outcome. Al-Nawas B, Schiegnitz E. Augmentation procedures using bone substitute materials or autogenous bone – a systematic review and meta-analysis. Eur J Oral Implantol. 2014;7:219-34. Antoun H. Les greffes du sinus en implantologie. Edition CDP, collection JPIO, 2011. Felice P, Pistilli R, Piattelli M, Soardi E, Barausse C, Esposito M. Eur J Oral Implantol. 1-stage versus 2-stage lateral sinus lift procedures: 1-year post-loading results of a multicentre randomised controlled trial. 2014 ;7:65-75. Paris, Founder of the IFCIA Institute.